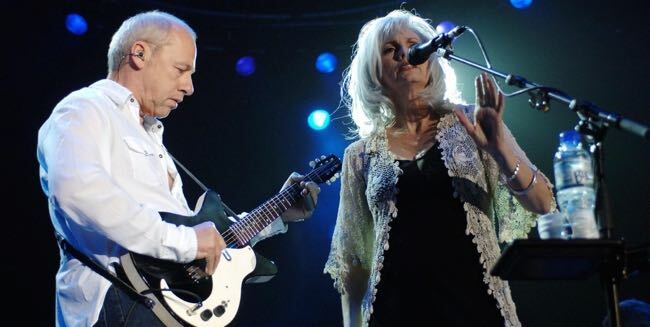 LONDON – If the pairing of rock’s Mark Knopfler and country’s Emmylou Harris seemed unlikely, you wouldn’t have known it from the crowd reaction at their tour stop at Wembley Arena where the twangiest country and purest rock both went down very well. The 100-minute show featured songs from the back catalogue of both artists as well as many from their new album “All the Roadrunning.” Both of them were in a good mood at the concert with Harris in full voice and Knopfler surer on guitar than with his growly vocals. The mix’n’match continued through the show as the set included classics such as “Boulder from Birmingham” from Harris’ 1975 “Pieces of the Sky” album and “Romeo and Juliet” from the Dire Straits “Making Movies” CD. The band was outstanding with keyboard player Matt Rollings, an original member of Lyle Lovett’s Large Band, joining the unit that worked on the “All the Roadrunning” album. They were Guy Fletcher, keyboardist with Dire Straits and the Notting Hillbillies, guitarist Richard Bennett, bassist Glenn Worf, drummer Danny Cummings, and Stuart Duncan on any number of stringed instruments including mandolin, fiddle and banjo. With Knopfler on lead and Harris also on guitar, the group achieved a rich depth of sound over which Harris’s impeccable voice soared and dived. This entry was posted in Music, Reviews and tagged Danny Cummings, Emmylou Harris, Glenn Worf, Guy Fletcher, Mark Knopfler, Matt Rollings, Richard Bennett, Stuart Duncan, Wembley Arena. Bookmark the permalink.